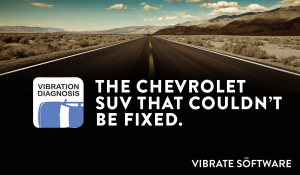 The Chevrolet SUV That Could Not Be Fixed - Vibrate Software, Inc. The most memorable “can’t be fixed” vehicle I have ever diagnosed was a full sized Chevrolet SUV. This vehicle had been sold new by a local dealership, it ended up having had a vibration problem. The service department tried several things to fix the vibration but could not fix it. The dealership bought the vehicle back and ended up selling it again. The new owner brought the vehicle back to have the vibration repaired. Again, the service department tried several things to fix the vibration but could not fix it. The dealership bought the vehicle back for a second time and then I received a phone call from the service manager asking for help. They had balanced the tires several times and had the new driveshafts balanced; nothing would fix this vibration. The vehicle must be a Lemon, it can’t be fixed. Using the same diagnostic procedure outlined in our new NVH smartphone app, a few students and I performed a quick road test of the Chevrolet SUV. The results of the road test indicated that the vehicle had a second order driveshaft speed related vibration. As the NVH app’s own diagnostic help file indicates, second order driveshaft speed related vibrations are only caused by a few select problems on the vehicle. While my students and I were working our way down this list of items to check, we discovered that the working angles of the universal joints of the rear driveshaft were unequal and beyond specifications for that vehicle. We performed some calculations and discovered that if we lift the transmission/transfer case mount a little higher above the crossmember, the universal joint working angles would become closer to equal. We installed a 1/8 inch thick shim under the transmission mount and road tested the vehicle again. The vibration problem was fixed. There were no bad parts on this vehicle. Two very unhappy customers were the result. Thousands of dollars were wasted on parts and many hours of labor were wasted because nobody really knew how to diagnose a vibration problem; they were just guessing! The NVH app eliminates the guesswork in vibration diagnosis and guides you step-by-step through the entire diagnostic and repair procedure. Get the NVH app today by clicking on the link below. I am a diy auto guy. I by trade (dentistry) love to fix problems and really like learning. I bought a 2002 rodeo from a patient with a transmission shift failure and Odometer and Speedometer problem DTC codes. While rebuilding the 4L30e transmission, I wanted to inspect drive line components and happened upon one of WEBERAUTO u tube educational videos by Prof. John Kelley and was instantly captivated by the excellent quality of video, and the concise and detailed accurate information discussed on every video I watched this weekend. I was so engaged that I ventured into more than 20 of his educational videos including all of the drive shaft and beyond. I want to Thank Professor Kelley for posting this awesome information and instruction. I hope you keep it up as I for one have felt enlightened on what I thought I knew and learned by trial and error, I now am more comfortable with some of the vehicle engineering.